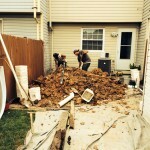 Having a damp basement is never a pleasant experience, but more importantly, it can be hazardous to everyone living in the home if the problem is not corrected. If your basement is dry, it can be a nice room to spend time in, depending on what you are using it for. However, having a damp basement will lead to mold growth, which for many individuals is a major concern as it can lead to health problems or aggravate the medical conditions a person is already suffering with. Having proper basement drainage beneath the foundation ensures that you won’t have to worry about mold growth and the impact it could have on you and your family. One of the first things to focus on is surface water build-up around your home. Many homeowners are shocked to find out how much water actually builds up as rain runs down off their roofs. For instance, an inch of rain covering an area of 1,000 square feet equates to roughly 600 gallons of water. You can quickly see why it is so important to keep this water from building up around the foundation of your home. Most roofs are constructed in sloped fashion so that rain water runs down the edge into the gutters that divert it to the downspout and prevents any build-up. Even though we are discussing the impact of poor basement drainage, it is equally important to ensure that your rain gutters are always clean and free of any debris so rainwater drains properly off the roof. Additionally, if water is just allowed to run off the roof without being channeled through a rain gutter, it will build up around your home’s foundation. 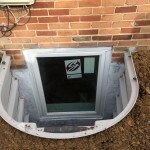 One of the recommendations where your roof drainage is concerned is to attach a 6-foot extension at the base of the downspout so that the water is diverted away from the foundation. 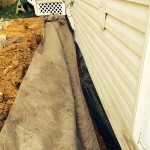 You should try to have the extension empty onto a solid surface such as your driveway. This will help to avoid the accumulation of water and prevent it from soaking into the ground surrounding the foundation. Just like the roof on your home, the ground surrounding the structure should have a slope to it as well. 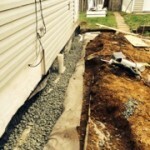 A 1” to 1½” slope that extends out about 6 to 10 feet surrounding your home’s foundation will enable better water drainage. This will also ensure that rainfall does not soak in around the walls. In a lot of cases, backfilling and compacting the earth around the home when it is being built results in the ground sloping towards the walls. Fortunately, all that needs to be done to correct this is to build up the ground so it slopes outward. Finally, despite the beauty that trees bring to the property surrounding the home, problems can result if they are not planted properly. As they grow, they can cause foundation and moisture problems if they are planted to close to your home. 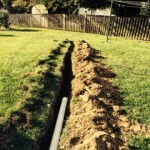 Root systems can grow extensively and either block the home’s perimeter drains or compact the earth surrounding the structure, eventually leading to poor basement drainage and moisture build-up.